Ever since its first release some time ago, when it was the fall’s major launch with full-page ads and movie-star faces and fancy commercials, Gucci Guilty For Women remains to be extremely loved even until today. Of course, Gucci Guilty For Women has always been promoted as ‘the 21st-century beauty’, so we should not be surprised upon its long-term fame. As a premium brand, Gucci is true to their words; Gucci Guilty For Women has certainly been crafted with sophistication and precision that the young, audacious, and discerning iconoclast becomes the choice of modern ladies who seek to project their true beauty. Gucci Guilty For Women has been designed to project sexiness, modernity, and libertine. Gucci Guilty For Women does not believe in labels or gender rules. It rejects the submission and wants to break such conformity. It changes the traditional boundaries; come on, we are living in the 21st century! To showcase its point, Gucci Guilty For Women embodies the spirit of freedom and equality by combining both male and female fragrance ingredients. It brings a signature Fougere accord of Geranium, which is often found in men’s scents, to project its modern spirit and confidence. Even so, it is nothing sort of a men’s fragrance; it keeps the unique and distinctive feminine characteristics with the intimate and magical lilac notes combined with the warmth and grace of amber. It is not a secret that Gucci devotees would go as far as buying Gucci products for the containers alone. 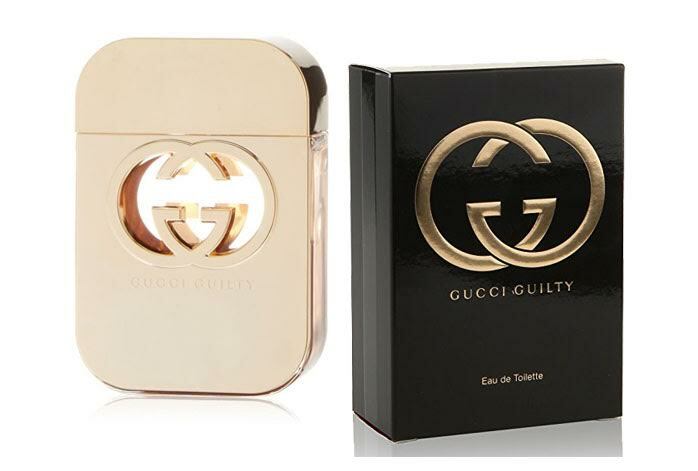 Gucci Guilty For Women is obviously one that any Gucci fan will immediately grab without a second thought. The perfume’s packaging is absolutely eye-catching. The outer box is colored in a luxurious black color with a light brown font. The Gucci Guilty’s unmistakable special logo is written in an embossed style. The bottle comes with a premium design. Again, the interlocking ‘G’s logo is featured at the center, creating a small transparent window that allows you to see the juice inside. Now, let’s take a deeper look on the scent’s characteristic. As said before, Gucci Guilty For Women has the signature Geranium accord. In general, it can be described as a sheer, fruity oriental scent. It is more fruity to rather than floral because it opens up with the fresh and bright top notes of citrus (more precisely, mandarin orange and bergamot) dusted with just hints of a pepper note that create some suggestive thoughts. Later on, as it develops its heart notes, you can feel the presence of sweet lilac that supports the Geranium projection, adding some sharp greenish note, while the golden fruit notes and peppery effect continue. You should not expect any earthiness from the patchouli ingredient in the base notes because there is no earthiness at all. After all, Gucci’s interpretation of sexiness usually emphasizes on luminous cheekbones and well-glossed lips minus any unsightly sweatiness. As the substitute, Gucci Guilty For Women dries down into a translucent and smooth projection of silky amber and syrupy patchouli. These base notes create a warm and sweet atmosphere, and then there is a faint vanilla note in the final stages to round up the perfume’s lite and oriental style. Gucci Guilty For Women is quite a flexible and versatile scent. You can easily use it for most occasions. A spritz or two can get you into most offices and workplaces. Some heavier reapplication will transform it into an attractive night wear. The projection and sillage are moderate. It is neither too heavy or intoxicating, nor too close to the skin. The longevity is also the average of an Eau de Toilette. Top Notes: pink pepper, mandarin orange, bergamot. Middle Notes: lilac, peach, geranium, jasmine, black currant. Base Notes: patchouli, amber, vanilla, white musk. Check the best price for Gucci Guilty For Women here!